Observed at Eldoret, Kenya, Africa. January 2012. Observed at Kitale, Kenya, Africa. January 2012. 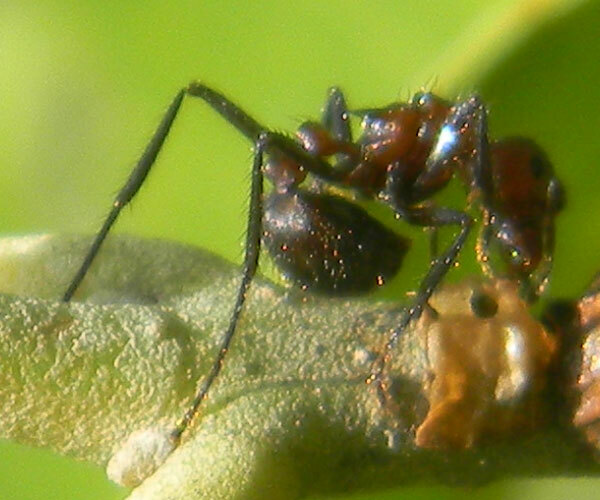 This ant was investigating some Armoured Scales on a twig of Muhutu (Terminalia brownii). The large winged ant is a queen and is about to leave the colony and will mate elsewhere and then attempt to start her own new colony. The workers are massing to protect her before she takes flight. Observed at Eldoret, Kenya, Africa. December 2015. These ants are part of a three member alliance (aided by a fourth) for survival in Tropical East Africa. It is a common arrangement between a homopteran, a plant and ants that occurs in many variations all over the world. Aphids are the homopteran in this case and are rather defenseless (apparently) insects that use straw-like mouthparts to feed on sap from the plant. They move very little and awkwardly, instead focusing on feeding and reproducing rapidly. 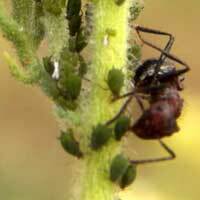 Aphids have many enemies from parasitic wasps to lady beetles. Plant sap has more sugar in it than the aphids need nutritionally so it is excreted as a waste product. Ants on the other hand being active, running creatures need sugar. 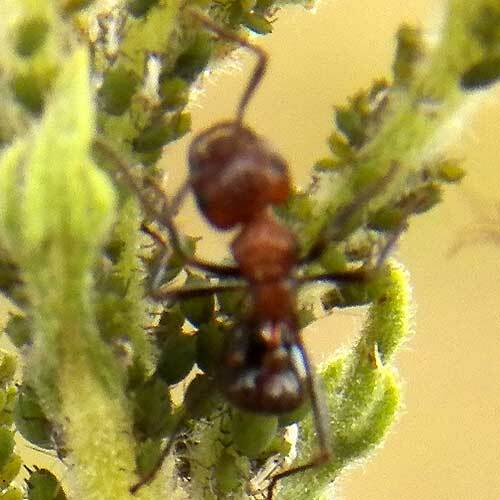 The ants tend and protect the aphids in exchange for sugars. It would seem that the plant gets nothing from this alliance, but it does because the ants keep at bay many other plant feeding insects and even larger animals. The ants prey on non-aphid insects and can sting or spray noxious gasses at seed eating birds or plant munching herbivores. Thus all three species can proliferate, especially in this case where the plant is avoided by grazing livestock. 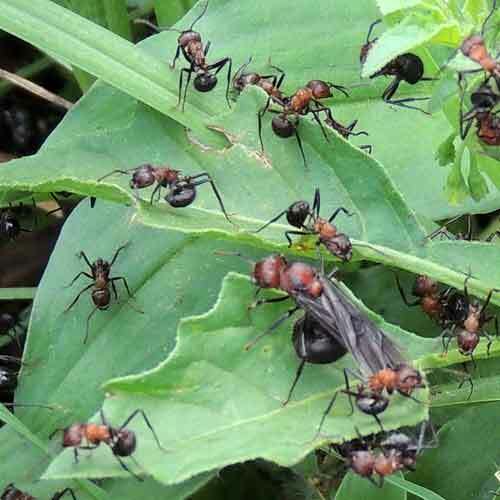 In highland areas of Kenya, this ant species is very common in agricultural settings. 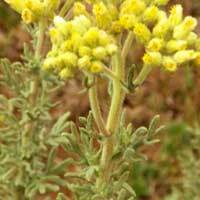 The plant in this case is a composite (Asteraceae: Conyza schimperi) and grows about 1.5 meters tall in pastures devoted to cattle grazing. The aphid species appears to be a composite specialist and might be found on sunflowers and other members of the daisy family. Click the thumb images for more information. The lower ant image at left appears to be a different species of Myrmicaria and it is in association with an Armoured Scale instead. There are many species of Myrmicaria ants in Kenya, but they all can hold the gaster folded ventrally. 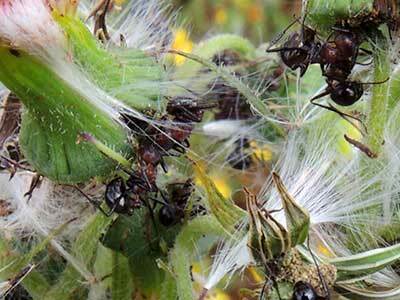 The ants in the image below are removing seeds from heads of another composite, Crassocephalum crepidioides.